October 2011 MII Report Description: The MBSauthority.com Mortgage Industry Index (Also called "MII") is used by economists, traders, and other industry professionals to gauge the sentiment of the mortgage industry and the direction of the housing market. Unlike Existing Home Sales reports, Home Builder Sentiment or other housing related reports, the MII is very timely and has current information which is never more than two weeks old at publication time. This gives analysts a good insight into current housing and ecomomic trends. 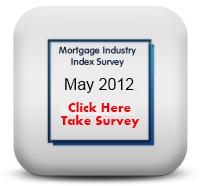 The MBSauthority.com Mortgage Industry Index is calculated from thousands of survey responses from mortgage industry professsionals. There are a core group of questions which never changes. And the formula to create the MII never changes so that the readings are consistent. We do add new questions to the survey from time to time but we never alter the core questions that are used to calculated the MII. Release Date and Survey Period: The MII is released at 8:30 New York time, on the second Tuesday of each month. Since the release of our MII can impact the bond and equity markets, we do not ever publish any preliminary findings nor do we comment on the reponses that we are getting from our surveys. The on-line survey is open and live starting on the 15th of month and continues until the end of the month. Results for that month are then published in 5-7 days making this the most current data in the market place. General Details: MBSauthority.com's Mortgage Industry Index (MMI) is the industry's premier source for sentiment and data from the mortgage industry. It is published each month on the second Tuesday. Our proprietary MBSauthority.com Mortgage Industry Index shows how the mortgage industry and overall housing industry is doing. In any given real estate transaction, only one party is privileged with all the information about the property, purchase contact, sellers, borrowers, etc. And that one party is the mortgage professional - real estate agents and home builders are not privy to the confidential and private information about the borrower. The MBSauthority.com Mortgage Industry Index is not conducted by any trade groups or associations. This means that the questions are not slanted to elicit a certain response and this is not used for lobbying or political purposes. This makes our index, data and statistics more valuable. MBSauthority.com is the industry's leader in providing mortgage backed security data, news, and commentary to thousands of mortgage professionals. Our membership base is a true cross-section of the mortgage industry with small broker shops, large wholesale and retail bankers and every point in between. You do not have to be a member of MBSauthority.com to participate in this survey. But you do have to be a mortgage professional Please take a few simple minutes out of your busy day to complete this survey. This is a clean and simple survey, but the results are very powerful. Your personal information is confidential and you will receive a summary copy of the report and the official MBSauthority.com Mortgage Industry Index. Both of which will help you to see how mortgage professionals view the mortgage business, economy, housing market and more. This is completely free, you will not be contacted with any solicitations.